Late last year I had a “little chat with Santa” about getting an AR upper in .460 Rowland for Christmas. It made for a fun piece. Well, actually I stole the idea from a friend: one of my BBTI buddies had been thinking about building his own 460 Rowland AR pistol since we tested the .460 Rowland caliber last summer (as a means of mitigating the heavy round’s recoil) and three of us have been kicking around how to get it done since then. 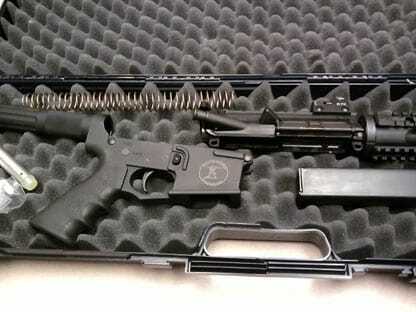 Early last week, the parts arrived and last weekend we got together in the laboratory to give assembling our soon to be custom AR pistol in .46 caliber the old college try. When considering the merit of this project, the question that most likely leaps forward is this: with traditional handguns like 1911 more than capable of handling the Rowland’s enhanced ballistics, why waste your time and money making an AR pistol? The reason behind this particular build combo though goes far beyond just pairing a novelty gun with a novelty round for the heck of it—there is a very good reason for this marriage and to understand it all one needs to do is look at how both the gun and the cartridge function. As mentioned in the “Dear Santa” piece and in my defense of the Rowland as a worthwhile upgrade to a concealed carry .45 caliber, we were very impressed with the performance of the .460 Rowland cartridge as it pertains to stopping power. 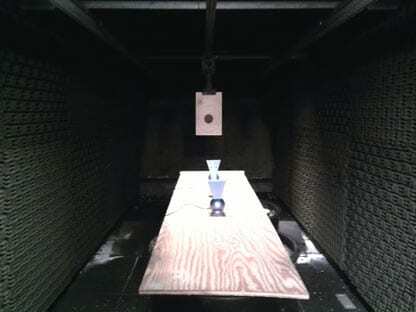 Across the board, it operates at about twice the pressure that the .45 ACP does, with a corresponding velocity increase of about 30 percent for a given weight of bullet (the .460 Rowland and .45 ACP bullets are the same). That’s a significant increase of power in the same size package. But that increase in power comes with more recoil. 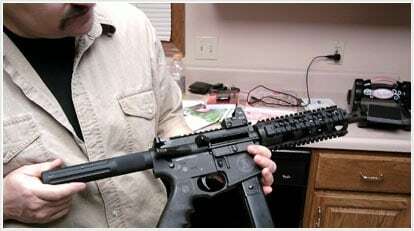 The idea was that building an AR pistol, which uses a gas-impingement system, would help to manage that recoil. If it worked, you would have an AR pistol with ballistic performance not far off .44 Magnum, but with less recoil, which would carry 20 to 30 rounds. That’d be one hell of a little gun. Built AR upper from Bazooka Brothers in .460 Rowland with a seven-inch barrel. Standard CAR length Rock River Arms buffer tube, with buffer and spring. Stripped AR lower from Bazooka Brothers. 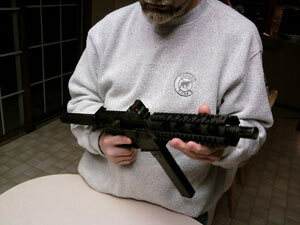 Lower parts package from Rock River Arms, with Two Stage Match trigger kit. Standard grease gun magazine (we bought ours surplus). The Bazooka Brothers parts were all quality. The machining which they did to the ejection port to make it a little larger was limited to only the front of the port – where the .460 Rowland cartridge would be. That meant less metal was removed, and told me that their attention to detail was quite good. This was confirmed by the condition of the other components, as well. The Rock River Arms parts were quality as well, just more on par with what I would call “stock” parts compared to the Bazooka Brothers. Assembly was very straightforward. Earlier in the week we built the lower and assembled the weapon in a matter of minutes (though this may vary depending on the style and make of your AR pistol). Make sure you are using the manufacturer’s instructions sheets (specific to the pistol you are building) and diagrams when attempting to piece your gun together. 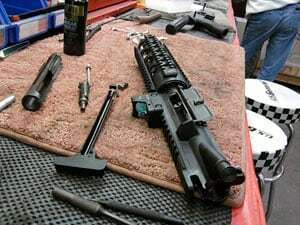 I also suggest you disassemble the upper and reassemble it if it came built and check over all the components before firing. After assembling the components, we grabbed a couple boxes of ammo and headed down to the police range. We decided to set up a chrono (slang for a ballistic chronograph, which records the velocity of a projectile) to check what kind of numbers we could get out of the new gun. We knew everything fit together properly – the magazine sat into the gun and cartridges in the magazine (while the .460 Rowland case is longer than the .45 ACP case, overall the bullets are the same size.) We checked to see whether the cartridges would cycle properly when operated by hand. They loaded and then ejected just fine. Well, mostly. Mostly? Yeah, sometimes the gun wouldn’t completely go into battery—cartridge chambered with the breach/bolt locked forward in place. Additional inspection didn’t indicate what was wrong, so we decided that perhaps it was just a matter of the gun needing a little break-in. 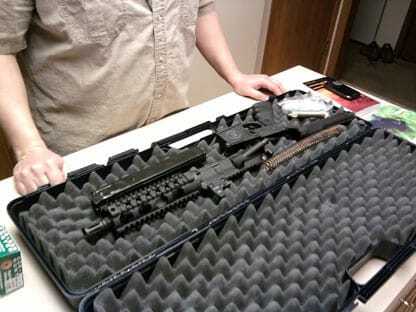 To accomplish that, we decided to just load one or two rounds into the magazine at a time. That almost worked. More on that part in a bit. First I want to talk what it was like to shoot the thing. There was more recoil than shooting an AR in .45 ACP, but not as much as one in .50 Beowulf. 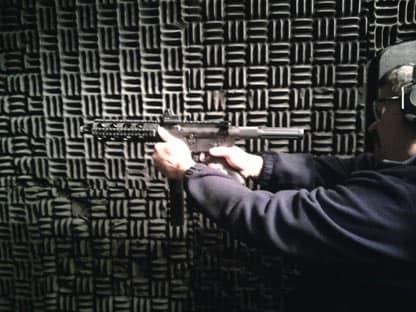 It was easy to hold onto the front rails and accurately shoot multiple rounds. The chrono numbers were pretty impressive, too. We were getting an average of 1330 fps out of a 230 grain JHP. That’s a solid 900 foot-pounds of muzzle energy. Yeah, we didn’t succeed in getting the gun to consistently eject spent cases or load new rounds. It’d do a few, then lock up. Usually, you could do the “tap, rack, bang” drill and keep going, but clearly, it wasn’t reliable enough to even think about using for any kind of defensive use. Stumped, we tried all the standard fixes. We took it apart and cleaned things. That didn’t help. We removed the weights from the buffer. That didn’t help. We tried holding it very stiffly, in case there was a problem with the platform not being stable enough to cycle. That didn’t help. From what we could tell, there were possibly several things going on: a problem with the magazine; a problem with the feeding ramp; or a problem with the ejector. Disassembly of the bolt and carrier and close inspection revealed that the ejector was worn a bit, which was unexpected because of it being new (like everything else except the surplus magazine). We spent a chunk of time discussing possible root causes and solutions. It was decided that one thing we’d do is contact Bazooka Brothers and see whether they had ever built one of these things before, and if so had they encountered the same problem. And then one of the other BBTI guys had a brainwave. We had the La France available, so we could compare the construction of it to see if it differed from what we had. And indeed, there was a clear difference: the extractor was set up differently, to allow for greater clearance for new cartridges to position more easily once they were stripped off the magazine on the way to be chambered. Tim La France must have had the same problem we’d run into, and had come up with this solution. We’ve now made arrangements to have a gunsmith adapt our AR to use the La France solution. And we’ll have to test the whole gun again to make sure that it will work reliably and consistently. But I don’t see why it won’t. I think the “proof of concept” was a success. We know that you get solid numbers shooting the .460 Rowland AR pistol, and that the recoil isn’t too bad at all – exactly what we’d hoped for. Our project needs more work. But I think it likely that those are just fairly minor tweaks. We probably spent more, and used better-quality parts than would be absolutely necessary. Which is to say that it will probably be possible to build a similar gun for less money. And if other manufacturers see that there might be a market for .460 Rowland components, competition will probably push prices even lower. I certainly hope so, because I’d like to have one of these for my own.